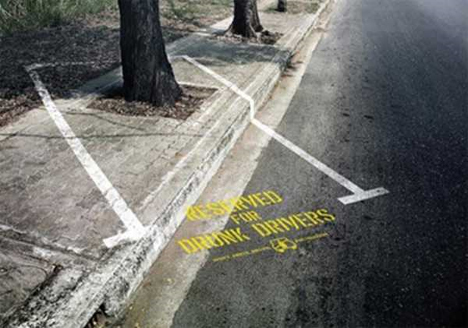 Outdoor advertising is all around us – on billboards, benches and even stairs. 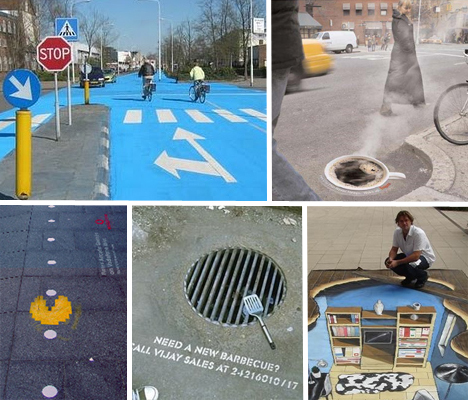 So it was only a matter of time before the ads took to the streets themselves in the form of stunning 3D chalk drawings, paint, stickers and even “reverse graffiti” which cleans messages onto dirty pavement. 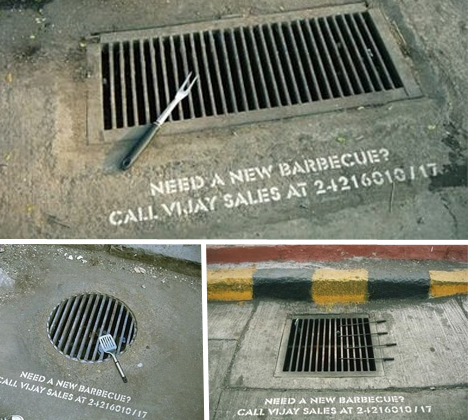 These 14 urban street ads sometimes blur the line between guerilla art and guerilla marketing, drawing in crowds and using their respective environments in clever and creative ways. 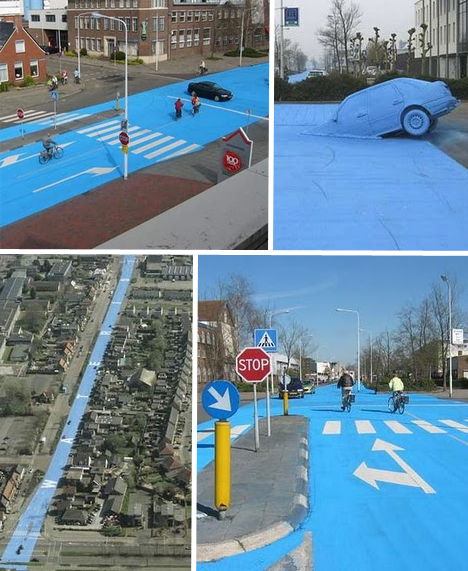 The town of Drachten in the Netherlands got an extreme makeover in 2008 when artist Henk Hofstra painted a kilometer-long strip of the main road a pale blue color. The striking shade is meant to give citizens of the town an idea of what life was like in Drachten back when this road was a canal. They’ll have to get used to the concept, because Drachten is in the process of reverting back to life on a waterway. When you see a steaming manhole in the streets of New York City, you’re probably reminded of the hot, smelly sewer that lurks beneath. 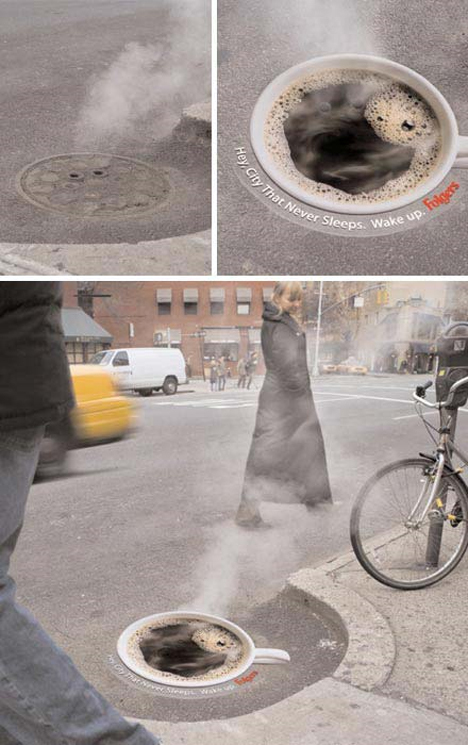 But Folgers decided to give it a new connotation with street sticker ads that transform manholes into hot, enticing cups of coffee. Though the effect is cool, Gothamist notes that the smell doesn’t exactly match up with the imagery. 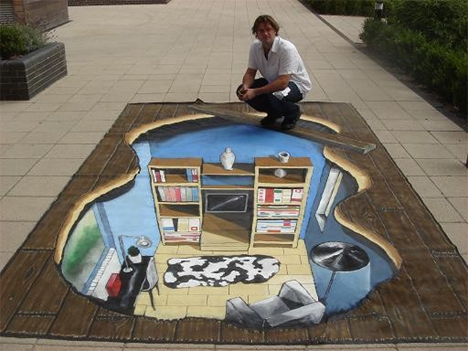 One of the world’s best-known street chalk artists, Julian Beever, creates jaw-dropping drawings in the streets that look incredibly three-dimensional when viewed from a certain angle. 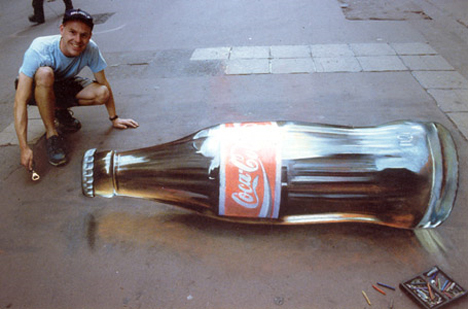 This one, an ad for Coca-Cola, is among his most effective works. 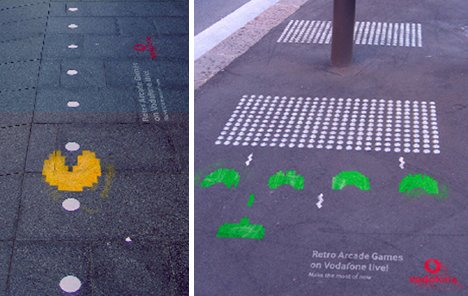 Vodafone made cult retro arcade games like Pac Man and Space Invaders available to play on their mobile phones, and publicized it with a series of attention-grabbing chalk street ads. While the greenest form of graffiti may just be made from moss, there’s another way to send a message on the street without using toxic spray paint: pressure washing. Layers of urban grime can be sprayed away in a pattern using a stencil, for an environmentally friendly ad that fades away with time. 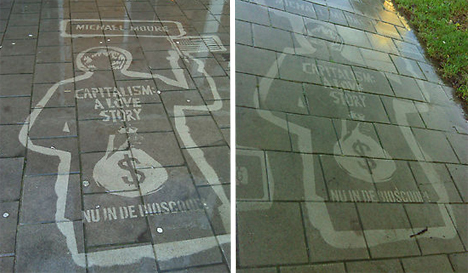 This one by Amsterdam ad agency Green Graffiti promotes the Michael Moore documentary ‘Capitalism: A Love Story’. An advertising firm called Street Advertising Services painted a series trompe l’oeil 3D street ads depicting IKEA products in a room, designed to draw in passersby as promotions staff passed out IKEA catalogs. 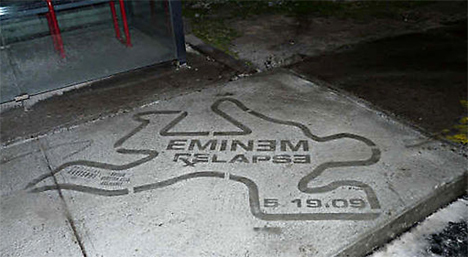 Rapper Eminem got in on the green graffiti trend with an ad campaign for his album ‘Relapse’. 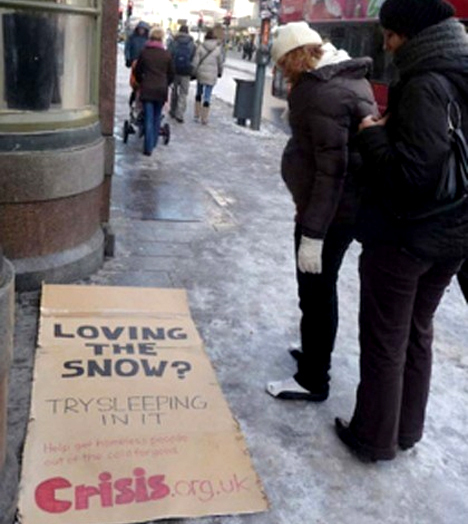 Subtle and impermanent, this form of street marketing is a great example of using ambient space effectively. 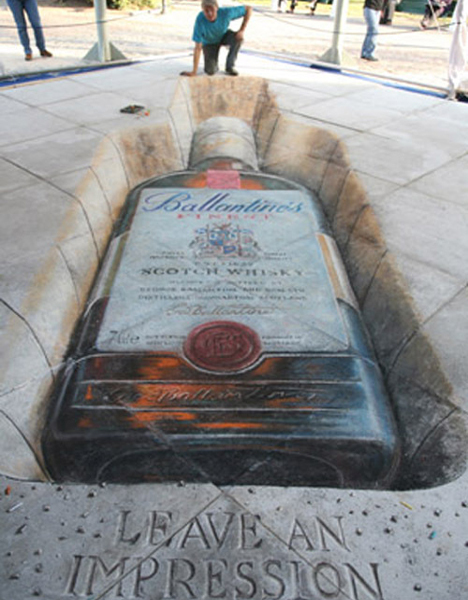 Chalk artist Julian Beever also created this street drawing of a bottle of Ballantine’s Scotch whisky “leaving an impression”. 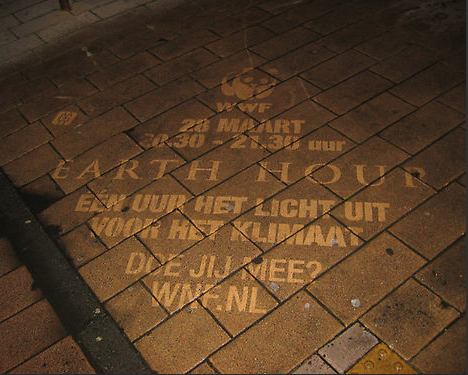 To promote Earth Hour – a global event in which the power is turned off for an hour to raise awareness about climate change – with wasteful paper and toxic inks would be hypocritical to say the least. This approach, using the “green graffiti” pressure washing method, gets the message across in a way that fits the event perfectly. 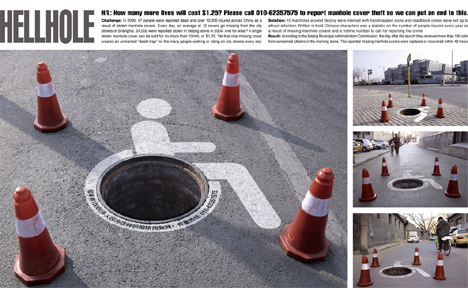 Manhole cover thefts have risen over the past few years as opportunists sell them for scrap metal, and it’s a big enough problem in China to merit an ad campaign warning of the dangers of missing covers. Serious injury could result from falling into one – perhaps serious enough to cause paralysis. That’s quite a zoom. Canon advertised its S1 camera model in 2006 with this sticker street ad. 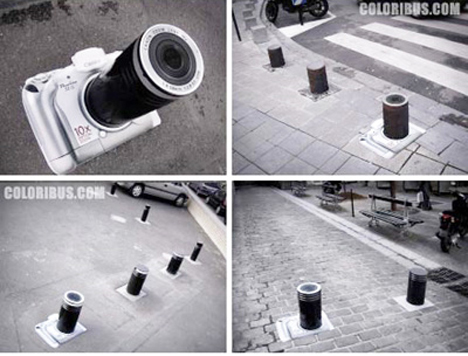 Not only does the column provide the perfect shape for the lens, its base sticks up from street level just far enough to give the camera a slightly three-dimensional look.